Creating Tailor Made African Safaris For Over 20 Years! 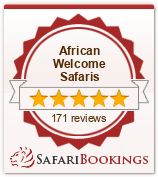 African Welcome has been arranging exclusive, high end, customised African safaris & vacations for over 20 years, we live in Africa, and have personally visited the properties we recommend. EVERYTHING you see is fully CUSTOMISABLE to your preferences. We’ll make sure that every moment of your dream holiday in Africa exceeds your expectations, giving you a tailored and unique journey through Southern & East Africa. We believe that a tailor-made African safari means seeing Africa your way!